We’d love your help. Let us know what’s wrong with this preview of The Gospel According to Tolkien by Ralph C. Wood. To ask other readers questions about The Gospel According to Tolkien, please sign up. It's been a few years since I read this book, and so I won't risk the sort of complete review the book deserves. I used to hang out frequently in various online Tolkien fan communities to share my love of Tolkien's works with other geek. One thing that always struck me about the conversations which developed in this places was how much fuller, deeper, and well reasoned the arguments were than those I encountered in published works by literary critics and scholars. The average literary critic rea It's been a few years since I read this book, and so I won't risk the sort of complete review the book deserves. I used to hang out frequently in various online Tolkien fan communities to share my love of Tolkien's works with other geek. One thing that always struck me about the conversations which developed in this places was how much fuller, deeper, and well reasoned the arguments were than those I encountered in published works by literary critics and scholars. The average literary critic reading Tolkien is I think, by virtue of his training, left poorly prepared to deal with Tolkien's work, and employs a method of analysis which is wholly alien to the author's nature and technique. For example, Tolkien openly hated overt allegory and metaphor, and eshewed as much as he could employing anything like one to one metaphors between the elements of his text and some real world figure or event. Yet, most scholars persist in seeing simplistic metaphors in his story and build up the most elaborate towers of balderdash about what the books are about despite the fact that such arguments fall apart under even the most cursory scrutiny. Too bad the highest rating allowed on Goodreads is only 5 stars. If you needed more reasons to love Tolkien, this book is the answer. Nothing is done without a purpose in his works. Unlike other writers, Tolkien does not make his Christianity blatantly obvious or shove it in your face. But the amazing thing is that it's still there, subtly, in everything. This book explains in good detail how Tolkien weaves it all in. There is more going on in this book than merely showing the reader that J.R.R. Tolkien's Christianity is present in The Lord of the Rings. I read this book when it first came out in 2005. I think I may have read it one other time along the way. But I have just read it again in preparation for meeting the author, Ralph Wood, at a conference last week. This time I really liked the book. The Gospel According to Tolkien brings together scripture, Christian history and doctrine and shows those things There is more going on in this book than merely showing the reader that J.R.R. Tolkien's Christianity is present in The Lord of the Rings. I read this book when it first came out in 2005. I think I may have read it one other time along the way. But I have just read it again in preparation for meeting the author, Ralph Wood, at a conference last week. This time I really liked the book. The Gospel According to Tolkien brings together scripture, Christian history and doctrine and shows those things in The Lord of the Rings. Wood's presentation is not merely academic. He shows the attributes of Christian spiritual development and shows where to find those attributes in both the Bible and in The Lord of the Rings to show examples of what those attributes do for the character in the novel. The best way to influence a person's thinking or to change behavior is by getting that person to have personal experiences leading to the change. A close second is to get the person to have the experiences vicariously through characters in a compelling story. Wood helps the reader by pointing to desirable Christian virtues and showing where they are in The Lord of the Rings in order to encourage thought within the reader to value and develop those virtues him or herself. 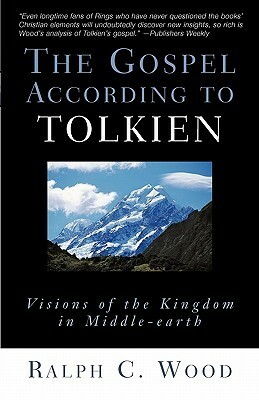 Further, by giving concrete examples of the dramatization of Christan virtues within the work of Tolkien he is demonstrating that Tolkien's method for influencing people to a Christian way of thinking was by creating his compelling subcreation of all of his writing, but currently appreciated most in The Lord of the Rings. 3.5 stars. A decent, general overview of themes in the Lord of the Rings and the Silmarillion as viewed through the lens of Catholic theology. It goes beyond superficial comparisons in most cases, but wasn't as meaty as I was hoping. Not a bad little book. I think the best thing about this book was that it got me thinking about the Lord of the Rings from a new perspective. I don't think the author's analysis is perfect, or even excellent, but it is eye opening. It causes one to think. And it got me excited to read the Lord of the Rings again! The hobbits' problem is, ironically, that they have no problems. They enjoy a virtually Edenic existenceso peaceful are their relations, so delightfu Not a bad little book. I think the best thing about this book was that it got me thinking about the Lord of the Rings from a new perspective. I don't think the author's analysis is perfect, or even excellent, but it is eye opening. It causes one to think. And it got me excited to read the Lord of the Rings again! While I liked much of Wood's analysis of LOTR, I wish the organization of the book had been stronger. The grouping of themes didn't make sense to me, and it often felt like he was jumping from one point to the next in a haphazard fashion. The TOC could be more informative. The book also seems to be stuck half-way between a commentary for the average reader and a scholarly work. As an average reader with a basic familiarity of LOTR, I would need more context for many of the illustrations and quote While I liked much of Wood's analysis of LOTR, I wish the organization of the book had been stronger. The grouping of themes didn't make sense to me, and it often felt like he was jumping from one point to the next in a haphazard fashion. The TOC could be more informative. The book also seems to be stuck half-way between a commentary for the average reader and a scholarly work. As an average reader with a basic familiarity of LOTR, I would need more context for many of the illustrations and quotes. I think you have to have a pretty good familiarity with Tolkien in order to follow it. As an academic, I would need more textual and critic support. I found it odd that no other literary critics were mentioned. Amazing and incredibly insightful, especially for those of us who are fans and know and live the great story better (thanks, Dad!). Even if you're not a Lord of the Rings fan or aficionado, you can still appreciate the parallels between Tolkien's work and the gospel of Jesus Christ. The Narnia series by C.S. Lewis, a former atheist converted to Christianity by Tolkien himself, merely scratch the surface. Just as Tolkien spent so much time creating a high-fantasy (detailed) world with its own fun Amazing and incredibly insightful, especially for those of us who are fans and know and live the great story better (thanks, Dad!). Even if you're not a Lord of the Rings fan or aficionado, you can still appreciate the parallels between Tolkien's work and the gospel of Jesus Christ. The Narnia series by C.S. Lewis, a former atheist converted to Christianity by Tolkien himself, merely scratch the surface. Just as Tolkien spent so much time creating a high-fantasy (detailed) world with its own functioning languages and cultures, he also spent a lot of effort putting in unmistakable Christian themes. Hey! I discovered the library has the audiobook and it is read by Nadia May. She is a fantastic narrator I can tell you after listening to the first CD. I am also really enjoying this book. Some of the insights I already knew, but others are from things I didn't know referencing a larger literary view, Tolkien's past, history, and Christianity. Wood is a graceful and interesting writer. Simply fantastic. Though the audio was really good it was a bit more than I could absorb well without seein Hey! I discovered the library has the audiobook and it is read by Nadia May. She is a fantastic narrator I can tell you after listening to the first CD. Definitely gives you insight into the gospel themes and Christlike analogies found in Tolkein's writings! Sent over middle-earth to men. These words embedded within a poem about Christ were, for Tolkien, a powerful evocation of an earlier pagan story, now lost, ‘something very remote and strange and beautiful…if I could grasp it, far beyond ancient English’ (Carpenter, Tolkien, 64). Far more than the legendary ‘In a hole in the ground lived a hobbit’, with which so many are familiar, the words ‘éala Éarendel’ sparked the invention of a vast body of tales that have become in a very real sense a mythology many would wish to call their own, a mythology in which pagan and Christian resonate with each other. (Perhaps there’s a larger lesson to be learned there.) For, as Tolkien saw it and wrote it, all myths contain truth because they echo the Evangelium, the myth that was true. On this showing we should expect to find that the ‘pagan’ or ‘non-Christian’ world of Middle-earth exists in harmonious counterpoint with the world of Christianity, with its perspectives and its values. This is especially so since Middle-earth is our world. The events of the legendarium took place in a ‘historical period [that] is imaginary’ (Letters, no. 183), a time so long ago that only snatches of the memory of those days, like the Éarendel of Crist, remain. Professor Wood does a good job of detailing for us the ways in which we may find those perspectives and values woven into fabric of Tolkien’s tales. His is a worthy endeavor that provides the reader with much to think on, and it is important to bear in mind that he has ‘undertake[n] not a scholarly study so much as a theological meditation on The Lord of the Rings.’ For there are moments where Professor Wood seems to push the limits of applicability much too far, as when he says that in describing the relationship of Saruman and Wormtongue Tolkien is stating ‘one of the deepest of Christian truths: all love that is not ordered to the love of God turns to hatred.’ Now their relationship certainly ended in hatred, but I see no evidence that love of any kind ever existed between the two. Wood also at times mars the credibility of his own arguments by getting his facts wrong. He claims, for example, that Frodo sees ‘Sauron himself’ when he sees the Eye in Galadriel’s mirror. Not so, except perhaps in a metaphysical sense. The giant flaming eyeballs of filmdom aside, ‘Sauron himself’ has a physical form. Gollum says he has only ‘four fingers on the Black Hand, but they are enough’, and Pippin’s description of what he saw in the palantír points towards a human appearance. Wood also confuses the Witch-king with the Mouth of Sauron, and gets the ages of the four hobbits wrong while making a point precisely about their ages. It's an indication of how good a book is, when it can be reviewed over and over and something new brought out every time. Wood analyzes Tolkien in the light of Tolkien's Christianity, and how that informs the story and the characters themselves. And while you can certainly read LotR without ever referencing religion - his or that implicit in Middle Earth - it makes for a good read. There are things in LotR, places where the story punches you in the gut rather than handing you what you feel that y It's an indication of how good a book is, when it can be reviewed over and over and something new brought out every time. Wood analyzes Tolkien in the light of Tolkien's Christianity, and how that informs the story and the characters themselves. And while you can certainly read LotR without ever referencing religion - his or that implicit in Middle Earth - it makes for a good read. There are things in LotR, places where the story punches you in the gut rather than handing you what you feel that you want, that make a lot of sense when taken in the light of Christian morality; the scouring of the Shire, the fading of the elves, the death of Saruman - spared by Frodo, but then murdered by his own servant - the passing of Frodo into the West, the sparing of Gollum and his saving of the quest - Aragorn's humility, the loyalty and indeed humility of every member of the party. Gandalf, who serves and toils and is eventually raised up. This book is unlikely to be of interest to anyone who is not already a fan of Tolkien's writings. I am a fan, so I picked it up hoping to get a little more insight into where Tolkien's Christianity came through in the story. I did not come away the book feeling that I had really made any new connections with meaning in the story, but it did help to reaffirm some of the things that I like so much in LoTR. The book points out some connections that to a strongly believing Christian are already intu This book is unlikely to be of interest to anyone who is not already a fan of Tolkien's writings. I am a fan, so I picked it up hoping to get a little more insight into where Tolkien's Christianity came through in the story. Wood is a serious Tolkien scholar who has pioneered much of the field of Tolkien studies. This book could have benefited from a better editor. There are some frustrating errors in grammar towards the end of the volume that speak of lazy editorship. Wood also makes the mistake of describing Boromir's funeral held by "Aragorn and the two young hobbits" (pg. 155) when it was Gimli the Dwarf and Legolas the Elf who assisted Aragorn. Wood's term "hobbitic" when describing Hobbit kind and behavior is Wood is a serious Tolkien scholar who has pioneered much of the field of Tolkien studies. This book could have benefited from a better editor. There are some frustrating errors in grammar towards the end of the volume that speak of lazy editorship. Wood also makes the mistake of describing Boromir's funeral held by "Aragorn and the two young hobbits" (pg. 155) when it was Gimli the Dwarf and Legolas the Elf who assisted Aragorn. Such a lovely book making connections between Tolkien's wonderful stories and the hope and truth of the Gospel. I am not familiar enough with The Silmarillion to appreciate the first section, "The Great Symphony of the Creation", but this certainly whetted my appetite to read it again. This book makes me grateful for those whose work points us to God. For a book with not many pages, this is a complex read. Although the title says 'gospel' do not look for a comparison with the Gospels. Rather, take the meaning of the word (good news) and you will be on the right track as you discover the kinship between Tolkien's writing and the Gospels. A very rewarding and illuminating read. An absolute thrill to read. The author really approached certain elements of how Tolkien's faith penetrates the Middle Earth Book Series! It is both a must read and a must own for any true Tolkien fan who wants to see more behind the story than just the events. A thoughtful and profound examination of the heroes and quest of "The Lord of the Rings" as one of the best of guides to Christians striving, hobbit-like, to serve their King and His purposes in a work far greater than themselves. A book that provoked lots of good thinking on both the Lord of Rings as well as Christianity. 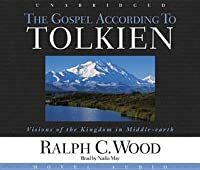 Rather than try to squeeze the gospel into a Middle-Earth mold, Wood instead exposes the worldview in which Tolkien wrote. This small work stokes both a love for Fantasy and a love for the Gospel. It's hard to pinpoint one's rating in the 5-star rankings. I'd actually give it 3.5 / 5 stars, or 7 / 10, but if I have to choose between 3 or 4 (as is the case), I'll give it 4 / 5. In this brief but penetrating book, author Ralph C. Wood accomplishes 2 things that make it pleasurable as well as insightful reading. 1) He gives a meaningful, insightful reflection on LOTR from a Christian perspective. As a Christian myself, it is hard to say whether or not this book would be equally valuable to non It's hard to pinpoint one's rating in the 5-star rankings. I'd actually give it 3.5 / 5 stars, or 7 / 10, but if I have to choose between 3 or 4 (as is the case), I'll give it 4 / 5. 1) He gives a meaningful, insightful reflection on LOTR from a Christian perspective. As a Christian myself, it is hard to say whether or not this book would be equally valuable to non-Christians, so keep that in mind. But, I suspect it will be a good read for any and all Tolkien fans, no matter their theological bent. What we have here is one man's theological reading of LOTR, or a least a reading of it informed by biblical-theological concepts and paradigms. Professor Wood offers a helpful (and convincing) presentation (not that anyone out there really needs convinced that Tolkien's faith shines through in LOTR---this is just a well done presentation on the "why" and "how" of that fact). It's not as deep or rigorous as Fleming Rutledge's volume on Tolkien, but it's the same "type" of volume, if that's helpful. 2) His reading of LOTR will enhance other's readings of LOTR. His insights coupled with his gift for achieving profound and clear thoughts in little space (as in, he's NOT long-winded or unclear) certainly have me eagerly awaiting my next venture through LOTR. I feel I will see even more in the work thanks to having read Professor Wood's volume. But among all these new books, Ralph Wood's The Gospel According to Tolkien stands out for its discussion of the Christian theology that informs the depictions of evil in The Lord of the Rings. This book was great. If you love to know more about Tolkien's world then this is a great book. It was a great companion to the books and I really enjoyed this book. The only thing that was a little was hard was that he quotes the 3rd book of the Lord of the Rings and I should have known that before going in because I have not yet read the Return of the King. Besides that I really did enjoyed the book. It was a very good read and I liked how he matched the themes in the Christian belief and connec This book was great. If you love to know more about Tolkien's world then this is a great book. Besides that I really did enjoyed the book. It was a very good read and I liked how he matched the themes in the Christian belief and connected them to Tolkiens work. He brought in some other quotes in as well that connect with what he is talking about. It made me think a lot about the Tolkiens books and the characters that I love in those books and I like when a book makes me think a bit about my faith in God and just about things. What a brilliant book! By far the greatest interpretive work on Tolkien's fiction that I've ever read. This is possibly the only work of literary-criticism I've read that opened my eyes to unseen depths in the world of an author's fiction while simultaneously enriching my own immediate world on the same level. I was frequently stunned at Wood's succinct and lucid genius in explaining perplexing issues of Tolkien's thought, while all the while imparting the profound wisdom of his main themes into What a brilliant book! By far the greatest interpretive work on Tolkien's fiction that I've ever read. This is possibly the only work of literary-criticism I've read that opened my eyes to unseen depths in the world of an author's fiction while simultaneously enriching my own immediate world on the same level. I was frequently stunned at Wood's succinct and lucid genius in explaining perplexing issues of Tolkien's thought, while all the while imparting the profound wisdom of his main themes into applicable virtues. This is the kind of book you could easily return to again and again (especially in conjunction with returning to The Lord of The Rings again and again). Wood, Ralph C. The Gospel According to Tolkien: Visions of the Kingdom in Middle-earth. Louisville, KY: Westminster John Knox Press, 2003. Lady Galadriel, played by Cate Blanchett in The Lord of the Rings trilogy, reveals a Sophia Christology, or Sancta Sophia. In Tolkein's fantasy world, Galadriel is the “Lady of Light,” telepathically wise and wearing shining white clothes. She is the mightiest, fairest, greatest of elven women and refl Wood, Ralph C. The Gospel According to Tolkien: Visions of the Kingdom in Middle-earth. Louisville, KY: Westminster John Knox Press, 2003.